Cassie Gretschel's little brother, Max, loves a specific, discontinued Tonka toy truck that his family has been getting him for Christmas for the past 17 years. But they've been getting harder and harder to find, so she asked the internet for help and cue the feels. Cassie Gretschel has bought the same Tonka truck for her 25-year-old brother, Max, every Christmas for the past 17 years. 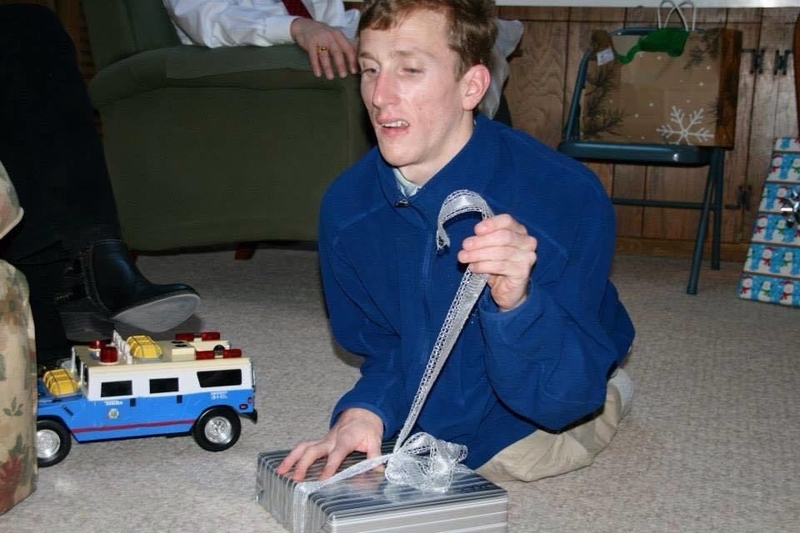 Max is mentally and physically disabled, and this particular truck is "literally the only thing he will play with." Finding this certain truck, however, she says is like "mission impossible." The Tonka Police Hummer truck was manufactured in 2000 and has since been discontinued. Every year, Gretschel and her parents scour eBay to ensure Max has one under the tree. She even has eBay alerts set up on her phone to make sure she never misses an opportunity to buy one. "They used to be really easy to find because we would just get orange ones, and then I made the mistake of finding a blue one on eBay and now he only wants blue ones," the 30-year-old from Maryland told BuzzFeed News Wednesday night. For Max, who Gretschel said was born with Cerebral Palsy and scoliosis, Tonka "only came out with a couple of toys over the years with levers that are super handicapped friendly." For her brother, who is also visually impaired and spends most of his time in a wheelchair, the truck's bright colors and structure is "pretty much the holy grail for a visually impaired kid who can crawl behind it without it going into the other room." "We have piles of them," she laughed. "Twelve are still active and then we have a few others we keep on hand for spare parts in case we need to repair." As a last resort, Gretschel, who is an artist, created a silicone mold of the police truck so she can make one herself if necessary. She said she had even tried customizing the toys herself, airbrushing, painting, and accessorizing ones Max already owned, but her brother "can tell the difference." 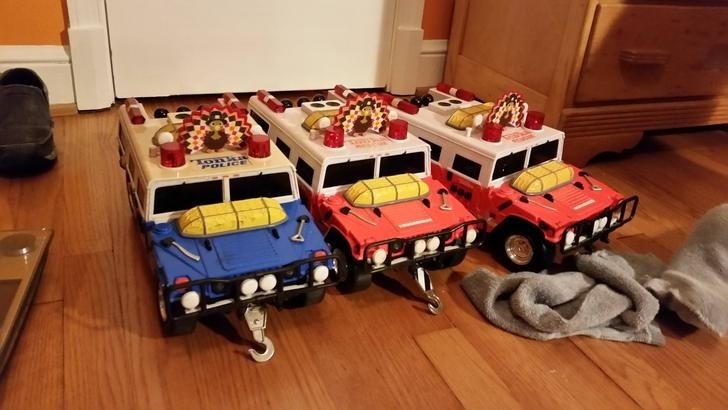 Worried about hunting down this year's Tonka truck, Gretschel took to Reddit in hopes of finding some people who had the trucks as kids so she could purchase one for Max. She shared photos of Max with his Tonka truck squad, explaining the importance and difficulty of finding one for her brother, and her post immediately went viral. Touched and determined, Reddit users swarmed the comment section asking if other models "were close enough." "Although I don't have that Adventure model, I do have the police model that I'd be happy to send you to share with your brother this Xmas. From what you say, I don't think that this is going to fit the bill though. Here is a photo of what it looks like. Let me know!" someone wrote. "I found one on Ebay and bought it. It's this one. I'll PM so I can send it to you when it arrives. Ebay says I should have it by the 6th. You'll have it soon after that. Yep, I know blue is preferred, but I'm hoping this one will work. I couldn't find a blue one," another user said. "Here's one posted on Ebay France. If you need help ordering, my boyfriend lives in Le Mans, France and has been helpful with this sort of thing before. However, according to the post, the item is located in US! I can ask him to contact the seller if there's a language barrier! Good luck OP, and Happy Holidays!" People on Reddit were floored that Tonka was joining the effort to find Max's truck. "Dude, Tonka just earned a new fan. Gonna buy the kids some Tonka toys this Xmas. How could I not support such a cool company after this," someone wrote. Tonka told BuzzFeed News "a massive outpouring of people" sent emails and private messages. "People were even looking for employees through LinkedIn and contacting their private emails," Jessica Gonzalez, a spokeswoman with manufacturer Funrise Toy, which owns Tonka, said Wednesday. "As soon as we received the first email, no one at this office batted an eye and we began searching for the toy immediately. We actually get a few stories like this sent to us every year and we always send toys to help however we can, but we’ve never been contacted like this through a viral post." "This one is tough because it’s such an old toy, we have to do extra digging," Gonzalez added, however, the company got their "address and we plan on sending her as many of those hummer trucks we can find as well as some additional Tonka trucks. Since he has special requests like, no rubber wheels, action levers, and a need for bright colors (he's legally blind), we plan on making some custom adjustments to some other vehicles in hopes that he’ll like those as well." Gretschel's quest to find the exact model and color truck for her brother also resonated with people, who started sharing their own experiences with friends and loved ones with disabilities who need certain things "just right." "My brother is about the same! He is 27 but has regressed to the point where he is in diapers and has no means of verbal communication. A few years ago, McDonald's had these Beanie Babies they packed in their kids meal, and for some reason my brother got ahold of one that was a monkey and he has always kept it in his hands ever since. For years, my dad would go on eBay just to find the exact same one (since it was specifically the Happy Meal toy, and not an actual Beanie Baby) so that any time my brother loses his Beanie Baby monkey, we have one to immediately replace it with. Sometimes it gets stressful, because his tantrums have really decreased after he found his Beanie Baby monkey, so when he misplaces it, we're all searching for a replacement to calm him down. Good luck with the trucks! True love lives on!" "As someone who is a guardian of a man with Down Syndrome, I'm half laughing and half crying because I know your frustration, and I can totally empathize with you. The hoops you jump through to get everything 'just right! '," someone shared. "My oldest son has autism and I felt the exact same way. We've custom printed posters and shirts, built toys, searched the internet for hours for insane products we know don't actually exist," another user said. A bit overwhelmed by how many people got involved, Gretschel said she didn't "expect it to go this crazy," as she was "just trying to find a lead" on a 2000 Tonka toy truck after one she had found in the UK ended up falling through. "It can get a little desperate," she said, since not only does Max get one for Christmas, he looks forward to playing with a new truck on his birthday in May, too. "We have at least one red one hidden in a closet for backup so we never miss a gift," Gretschel continued. "It's like an all-year mission, but we haven't failed him yet." When he's not playing with trucks, Max sails in the summer and often participates in marathons, thanks to a group called Athletes Serving Athletes. He also lives in a group home in Baltimore, where he has "a lot of friends" and is in the drama club. "People expect me to treat him differently but it's just like having a little brother who never grew up," she said. "I still treat him like my annoying little brother, but I never want to let him down."